Lekha Washington in promotional pictures. All hail the king of minimalism. The creative tour de force behind Raw Mango, Sanjay Garg, has almost single-handedly redefined red carpet glamour with his handloom saris. Close to six years after Raw Mango was launched, we find that Garga��s refreshing palette of weaves is no longer just the conscious choice of the anti-glamour movement but the first choice of powerful women across India. From politicians and journalists, to ubiquitous celebrities and a�?reala�� women, his deceptively elegant weaves are preferred even by brides. 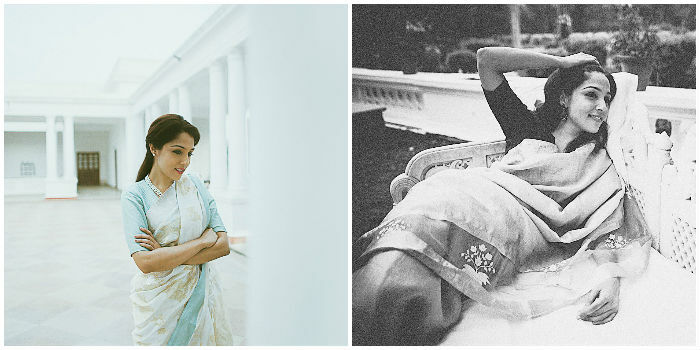 The designer is back in Chennai with his latest collection of Varanasi and chanderi saris inspired by the incandescent Maharani Gayatri Devi. Telling us about this singular collection, Garg says, a�?a�?Gayatria�� is very different from my earlier work in terms of layout, motifs and colours. The design vocabulary of a�?Gayatria�� is European in spirit and represents the style of the princely era. We are known for our bright palette but with this collection we have tried to relive the romanticism of that era by using pastels.a�? Acclaimed for her beauty, the Maharani also became a style icon with her chiffons and pearls. a�?Her style could be defined as regal but at the same time demure,a�? says Garg. The imagery in the saris consists of bougainvillea woven to look like delicate lace following the forms of scallops, cartouche and wreaths. a�?French knots and intricate woven motifs are the highlights of detailing in the collection.a�? Garg, who works closely with weavers, admits that their inputs, at every stage of the tedious and intricate process, is vital for the realisation of the product. From the selection of the best quality yarn to dyeing to the accuracy of the layout, everything is controlled by these skilled artisans.